I'm a huge fan of fragrances. While my tastes have change over the years, I still tend to stick to vanilla or floral scents. When I was pregnant with Scarlett, I had shocking morning sickness and I couldn't stand any scents (even the smell of water!). Since having her, I still struggle with fragrances. A lot of the fragrances I have remind me of being pregnant (and being nauseous), so I now only have a very small collection of perfumes. I've adored the MOR Marshmallow Eau De Parfum for quite a few years. It's the perfect scent for winter as it smells like a warm hug... if a warm hug had a scent! The actual smell is a mix of musk, jasmine and cotton candy. It's quite a powerful scent, so I only use one spray in the inside crease of my elbow or else I'll be that person with the perfume that's so overwhelming that you get a headache. Another product that's quite powerful is the Molton Brown Heavenly Gingerlily Eau de Toilette. * It's another one of my perfumes that I only use one spritz of. It's more summery than the MOR perfume. I've mentioned before that I'm not the biggest fan of celebrity scents. Many of them are low in quality (and disappear within and hour) and are sickly sweet. But 2 celebrity scents that I like are perfumes from JLO and Beyonce. The JLo Glow (not pictured) is a favourite of mine that I've run out of. It has a soft scent that lingers all day on your skin and it smells like baby powder. She used to have one available called Miami Glow, which was my summer scent but she discontinued it and broke my heart! Beyonce has some really great perfumes that have a very grown up scent. I have the Beyonce Heat Wild Orchid* (not pictured) which is a gorgeous fruity summer scent and Heat Kissed* which I prefer in the colder weather as it's a warmer scent with a subtle fruity scent. Most days I normally use either the LAVANILA The Healthy Fragrance Pure Vanilla,* the Vanilla Passion Fruit rollerball or I like to reach for the Jurlique Essence of Rose Roll On Fragrance Oil. * It's a beautiful scent that's perfect for those days when I'm finding that the vanilla scent smells too cake-like. Lately I've been using 2 soaps from Lush in the morning that I picked up over Christmas. You can see them here. 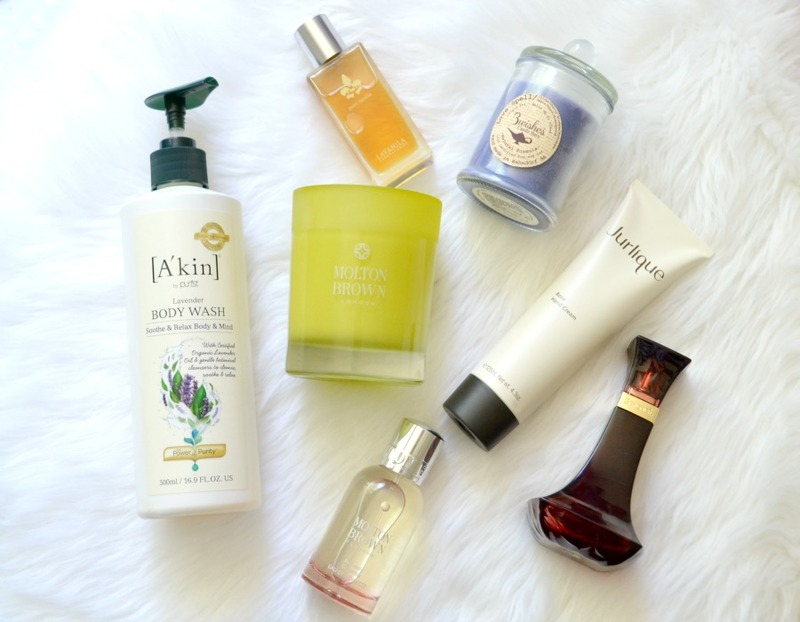 To help unwind at night, I like using the Akin Lavender Body Wash. It helps to relax me after a long day. I like using a scented body lotion at night or on days when I don't wear perfume. The LAVANILA The Healthy Body Butter in Pure Vanilla* works well underneath my LAVANILA or MOR perfume. 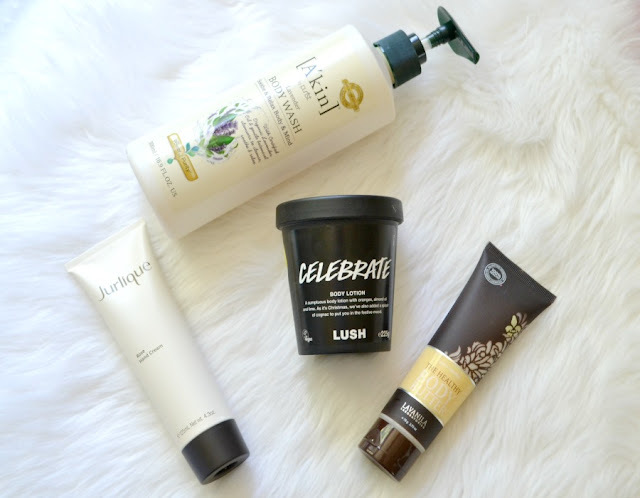 Otherwise I love the Lush Celebrate Body Lotion. * Celebrate is a very uplifting body lotion, but sadly it was a Christmas edition. Otherwise their Vanilla Dee-lite Body Lotion is amazing. Scented hand creams are a nice way of adding a bit of luxury into an otherwise boring day. Jurlique does amazing hand creams. I adore the Rose scented cream and anything from their Jasmine range is always my favourite (especially the jasmine body wash). I'm a huge candle addict. I have so many that I could probably open my own store. I really love buying candles from local markets. Here in Adelaide there are some wonderful brands that sell candles both online and at markets. My favourite brands are Vela Aroma and Luna and Luxe. There's also a wonderful candle store in Hahndorf called 3 Wishes Candle Barn. Glasshouse and Molton Brown* do some amazing scents. 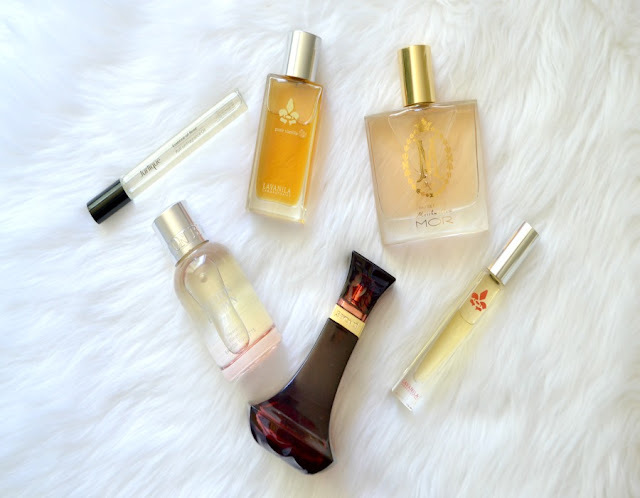 Both brands have such a wide range of scents that you'll be able to find a scent (or 5) that you love. They're on the pricier side, so I'd suggest either Natio, Circa Home or Ecoya. The Natio* candles are just as great as Glasshouse (I'd say even better, although they only have a limited range of scents) but almost half the price. 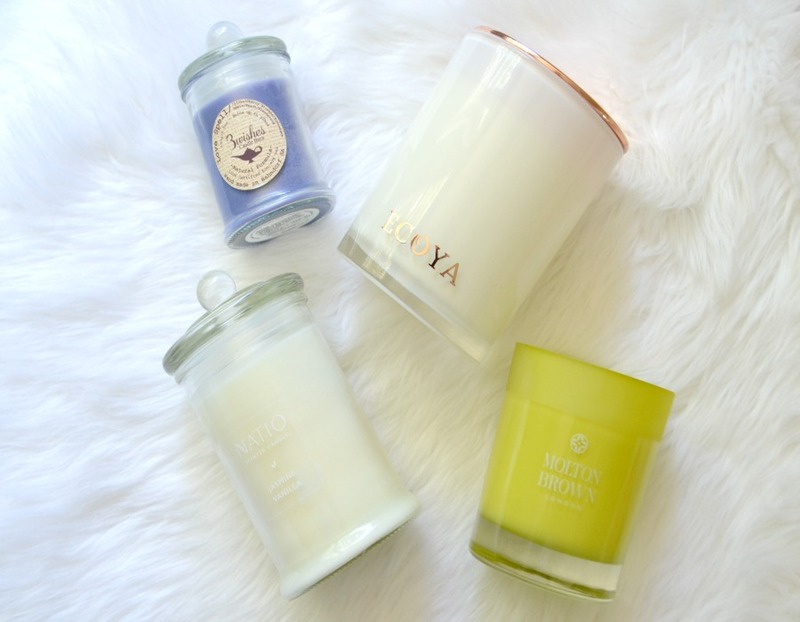 The Ecoya Sweet Fruits and Pink Champagne candle from their Christmas range is amazing and I'd recommend picking one up if you can still find it. I remember when my friend was pregnant, she couldn't have lunch with everyone else because of all the smells so she would sit in my room as she could handle my lunch smell haha. I love a whole range of scents from fresh, floral and fruity. I remember JLo Glow! I use to love JLo Live - so fruity! Ohhh no the poor thing!!! It's really awful when everyday life is impacted like that. simple things become so difficult. Ohh yes, JLO Live!! I loved that too!